Requirement: Disable Everyone group in SharePoint Online. "Everyone" claims in SharePoint Online consists of all users already having access to the site - This includes all accounts from the authentication provider (typically Active Directory) as well as any external accounts that are invited to the tenant. This is equivalent to the "all authenticated users" who needs to login (not anonymous users). From SharePoint Online Management Shell, Type: Get-SPOTenant to get all properties of the SharePoint Online tenant which tells us whether "Everyone" and "Everyone Except External Users" groups are hidden. "Everyone" group can be hidden from Office 365 SharePoint Online tenant people picker with the below PowerShell script. How to disable everyone Group in SharePoint Online? To disable everyone, enter the below PowerShell snippet in SharePoint Online Management Shell. If everyone group is missing, you can enable it with below PowerShell. When you add a new user in Office 365, The user become member of "Everyone except external users" group automatically which is granted with member permissions of the site by default. 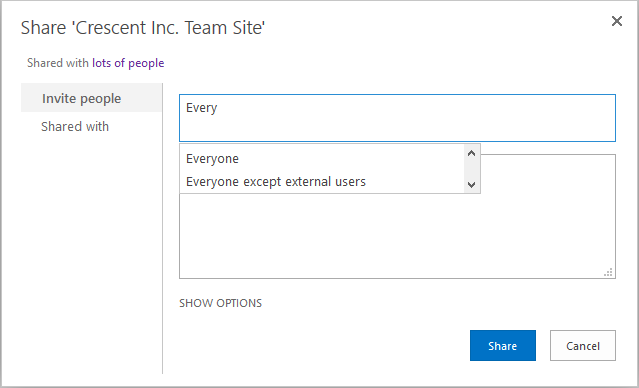 To grant all internal users (employees) access to a SharePoint site , You can use "Everyone except external users" Group. Typically, when you need to make a site available to everyone in your organization (E.g. Intranet Site) you use "Everyone except external users group" instead of "Everyone" Group. In case, If you want to disable "Everyone Except External Users", you can set "ShowEveryoneExceptExternalUsersClaim" value to "False"
This hides "everyone except external users" in SharePoint Online. Please note, these changes does not impact any existing permissions. and we can't add/remove users to these two built-in groups!